You’re never too old to rock out at Halloween! Get dressed in your best costume and shake your bones in the heart of Edmonton’s River Valley with a deadly line-up! 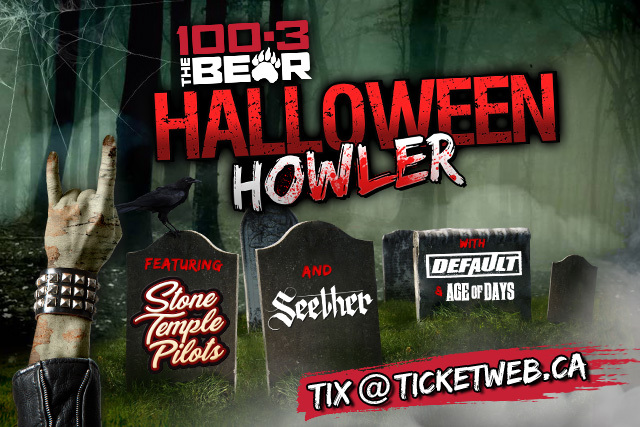 100.3 The Bear, Nitza’s Pizza Wye Road and Trixstar present the 26th annual HALLOWEEN HOWLER featuring Stone Temple Pilots and SEETHER with guests Default and Age Of Days on Friday, October 26. Win thousands of dollars in costume prizes, enter to win The Bear’s infamous hearse and help support our community, with this year’s proceeds going to The Bear’s Children’s Fund. Time: Doors 8 p.m. / Show 8:30 p.m.
Tickets $77.90 (incl. GST and s/c). Pre-sale Friday, August 24 @ 10 a.m. – Sunday, August 26 @ 10 a.m.
Code Text VIP to 666-666 and become a BEAR VIP to receive the pre-sale code on Friday morning. On-sale Monday, August 27 @ 10 a.m. MST. This is an 18+ general admission event. Valid Government issued ID must be presented. No weapons are permitted. Why are you waiting? 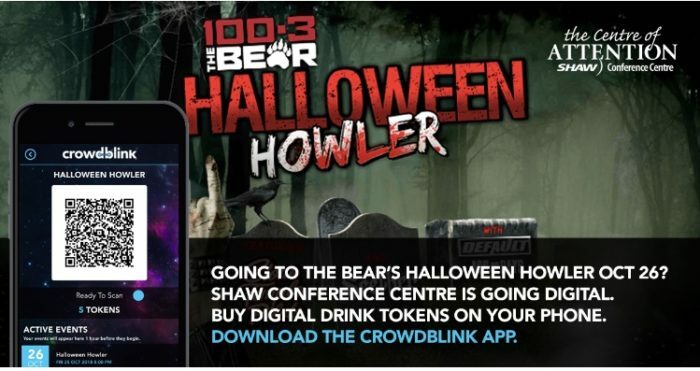 Skip the Cashier line before the Bear’s Halloween Howler! Download the free Crowdblink App on the App Store or Google Play Store to pre-purchase your drink tokens and enjoy your event sooner! Crowdblink drink tokens can be used to purchase beverages at all bars within the venue (drink tokens are non-refundable and will expire at the conclusion of bar service). "This venue is in a great location downtown, surrounded by many hotels. It has many rooms of different sizes and can accommodate any group. The catering is top notch."